Woolove wants to give three podcast listeners set of blocking mats! 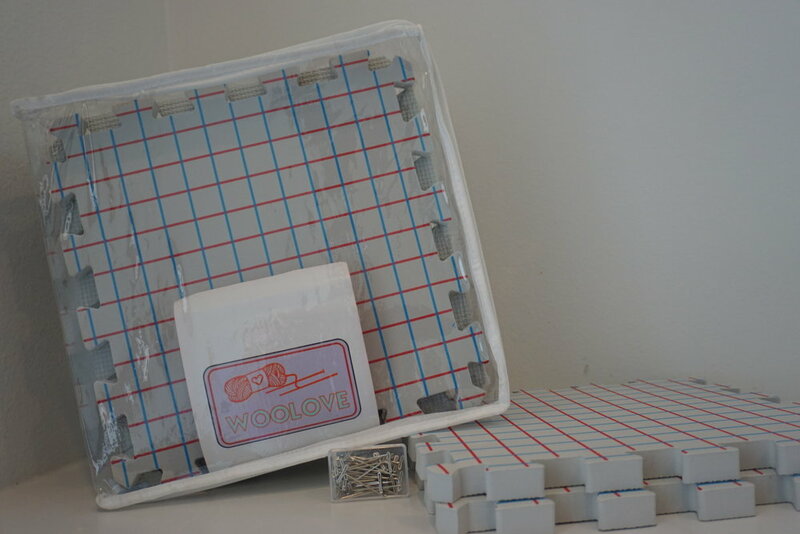 Woolove blocking mats come with blocking pins and a zippered case for storage. Winners announced!! Congratulations to Travis, Dea and Tabitha!!! This sweater I made 10 years ago is going to another little boy for a second life. Flexibility - I have a great blocking board, but the size doesn't work when I make something like a shawl or with smaller items like kid sweaters. It is limited to the 30 x 48 size. With these mats I don't need to pull out the big board when I only need one mat for a small project or I can create one long mat for longer pieces. Storage - The mats zip up tidily in the case so I don't have to worry about losing a piece or watching them fall from the shelves and make a mess. I can pick them all up with one hand when they are stored in the case and keep them neatly in my yarn closet. (Yes, I have a yarn closet. Don't you?) The set comes with a box of pins, so I can store those pins zipped in the bag with the mats. My Wonder Woman wrap is too long for my regular blocking board. Easy measuring - Other similar blocking mats do not have these 1 inch grid lines. Now, I can easily block to the measurement I need. Affordable - For less than $40 the price is affordable. If you're not a lucky winner, put it on your wish list or treat yourself. Win a skein of yarn from Seven Sisters Arts!